Investigations in to ecosystems are very complicated since there are so many different factors that need to be considered. Biotic factors are living factors affecting an organism, such as food, competition or disease. Abiotic factors are non-living factors, some of these, how they can be recorded and their importance are outlined in the table below. pH pH meter (electronic) or chemical test The pH measures how acidic or alkaline a solution is. The pH of water is particularly important for aquatic organisms. Low pH (acidic), interfers with ion regulation and reduces efficiency of haemoglobin. It is not possible to survey an entire area, so small areas called samples are taken, there are two methods used. 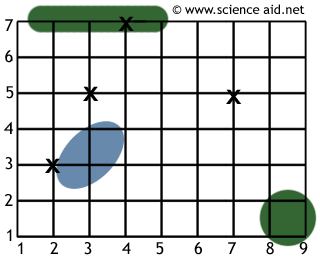 Quadrat sampling takes small areas, randomly chosen from an ecosystem, these areas are bounded by a metal frame called a quadrat. Where to place the quandrat is usually decided by dividing an area in a grid, and then randomly selecting co-ordinates (throwing isn't scientific enough!). Quadrats are more useful for comparing species in two different areas, and for practical purposes are used in ecosystems without tall vegetation - such as meadows or shores. A problem is when counting plants, but they grow in clumps; this is overcome by calculating the density or the percentage of ground covered. A second method is transect sampling, this is used to measure the change from one area to another. It is carried out by laying a line along an area, and then recording species the line touches, or placing a quadrat at regular intervals. Once you have performed an ecological investigation, you will have a lot of data and need to represent and interpret it somehow; to do this we use statistics. 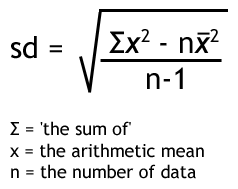 One method of interpreting the mean that you may be familiar with, is the standard deviation. This is a measure of how spead out the data is. For instance, 10, 11 ,12, 13, 14 have a mean of 12, but 1, 1, 1, 1, 56 also have a mean of 12, this is where the standard deviation is useful. If you notice a change in two conditions, is this merely down to chance, or something else? This is where statistical tests are used - they tell us whether a change is significant. One such test that is commonly used is the Chi squared test.